It was with shock that the news came about Thai action legend ,stuntman,Action Choreographer and Director Panna Rittikirai passing at the weekend at the age of just 53..
Star of many films in Thailand in the 80's and 90's Panna went on to define the way films are made in Thailand. He directed his first film 1984 ,''Gerd Ma Lui'' which is actually the original to the film ''Born to Fight ' from 2004 ,which Panna also directed. Of course Most of us in the West will know him for the showstopping film Ong Bak (2003) where he was the action director , directing his student and friend Tony Jaa. He went on to action direct Tom Yum Goong,Mecury Man and Born to Fight. After that he gave us Jeeja Yanin Vismitananda in Chocolate , another showstopping film with full on action.. 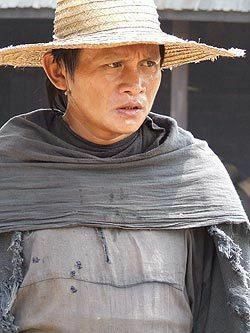 In 2006 he starred alongside Thai action hero Dan Chupong in Dynamite Warrior ,giving a full on performance as the bad guy who fights Dan Chupong at the end of the movie. Well be doing a small feature page on the late Master Rittikrai ,where where look at some of the films he set the world alight with.. It's quite hard in the West to source the earlier films .But where do the best we can to honor him..
Panna Riitikrai passed away on July 19th 2014. He was taken ill last November with Liver disease. It was later found that he also had a Brain Tumour ..